It is so funny because he looks chunky and round...not skinny and scrawny like his stats say he is. He is just kinda swished...miniature. I love it. He's sooo flippin cute! Mya had her birthday party this last weekend. She wanted a princess party, so we had all the girls dress up as their favorite princess and made a princess castle cake! She had a blast. Nanny and poppy bought her his radio thing with a microphone. I can hook up my ipod to it and she can sing along to it. She walks around the house like this all dressed up and sings her little heart out. Her favorite songs are- poker face, you belong to me, and mamma mia. she knows all the words to these songs. Last weekend Tyson's uncle was killed in an avalanche. Scott was snowmobiling with his son Nick, when the snow crumbled below him and buried him 2 feet under. Tyson, his dad, and brothers were a few miles away from where Scott was. I tried to call Tyson to get him to go help in the search...but i thought..."he's snowmobiling...he's never gonna answer." Well about minute after I called him he felt he should call me. He did, I told him Scott was in an avalanche and they can't find him. Ty, and his dad and bros took off as fast as they could and located Nick within 10 minutes. Nick was by himself with no shovel or anything trying to find his dad...it was an impossible task. Can you imagine trying to do that all by yourself??? Poor Nick. Tyson and his dad had shovels and a probe. Bron eventually located Scott with the probe and they dug him out. He was in the snow for over an hour. They pulled him out, and immediatly did CPR. Tyson and his dad took turns with CPR until the search and rescue came and told them to stop...that it was over. The paramedics took Scott away in the helicpoter. Nick, Tyson, his dad and all the brothers just sat there....shocked over what happened and just devestated. Tyson was sooooo close to his uncle Scott. He was more like a brother to him. It's been quite a week getting ready for the funeral. 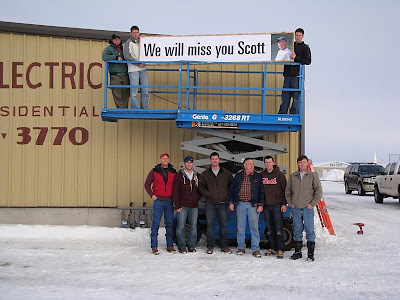 I am so grateful to have known Scott. We will miss him so much. This is Scotts wonderful family. They have all been so strong during this whole ordeal. Tyson built this sign that we put up on the Leishman Electric building. 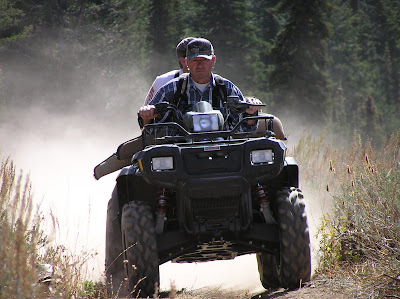 Here is Scott on one of his last hunting expeditions. He loved the mountains. Ironic that it's the thing that took his life.